Kori and I met in Charlottesville in 2012 right after Mazen was born! Now she’s a fancy RD and all that jazz : ) Her post today is creative and inspiring! I once spent a few weeks in a hotel while we were in Montana for Great Harvest training, but Kori spent over a month in one while she took on her first job out of town. She did a great job balancing away-from-homemade meals and exploring the area. Hope she gives you some great ideas! Hi, my name is Kori Higgins, and I am a Registered Dietitian in Knoxville, TN. I have been very fortunate thus far in my dietetic career, which only just begun in February when I passed the exam. For my first job out of the gates, I was offered a temporary position right away in none other than West Palm Beach, FL! A long-term care facility had been unable to secure a full-time RD since last fall, so they were filling the position on an interim basis. As soon as the deal was finalized, I began planning what all I needed to pack, which of course included food. I realized that living in a hotel for the better part of a month was going to be a little tricky. However, with the right amount of planning ahead, I was sure I could both explore West Palm Beach through food as well as prepare several meals right in my hotel room. I knew in advance that I would have a small sink, mini refrigerator, and microwave, so I planned to take full advantage of these amenities. On the first night I made a trip to the store and purchased fresh fruit, greens, baby carrots, Greek yogurt, tempeh, individually packaged guacamole, hummus, cheese sticks, whole-wheat pita, and peanut butter. Now I had all the makings of filling breakfasts, balanced lunches, and adequate snacks. Over the course of my stay, I made several trips to the store and was able to assemble delicious breakfasts, lunches, and several dinners. I believe this gave the best of both worlds, so to speak, in that I dined out and still was able to cook, which I greatly enjoy. Aside from my food and meals, I also incorporated exercise by walking around the area of the hotel as well as all around downtown West Palm Beach, I walked along Palm Beach one afternoon, and I made use of the hotel’s exercise facility. I really love walking and in doing so, I was able to sightsee at the same time. I was thankful for the experience but was really excited to get back home to my routine. I believe that my planning ahead and setting myself up with foods that I enjoy made the transition to working there much easier. It is amazing to think that my first job as a Registered Dietitian was in of all places a different state. I hope that my experience helps you to think of new ways to incorporate healthful eating into your travels, wherever they may take you! 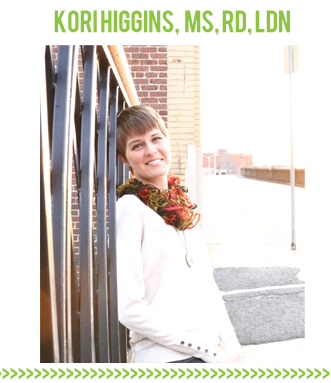 Kori Higgins, MS, RD, LDN is a Consultant Registered Dietitian in the Knoxville area. She was fortunate to obtain this job directly after taking and passing her RD exam. She enjoys cooking, reading, going on long walks, being outside, spending time at her lake house, and being surrounded by her friends and family. Great tips! We need to get better about making breakfast especially at home and not having every meal out on vacation be a free for all. It’s not doing my waistline any favors. 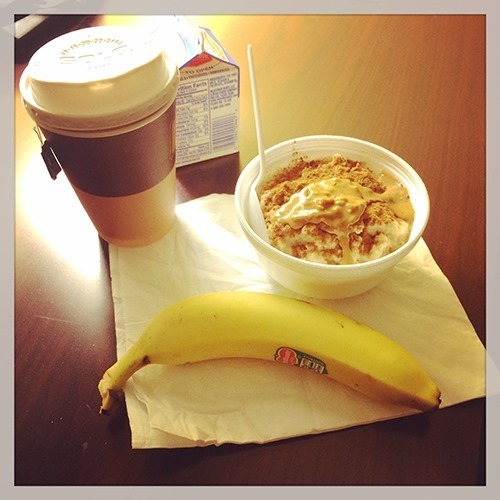 I love when I’m traveling to have oatmeal from the hotel for breakfast along with a banana and peanut butter too! oatmeal is definitely my go-to food when I’m out traveling, although I’ve never had to spend that long in a hotel! I ate a lot of quest bars when I was in europe (I brought them along) since I’m GF and I needed to be cheap. 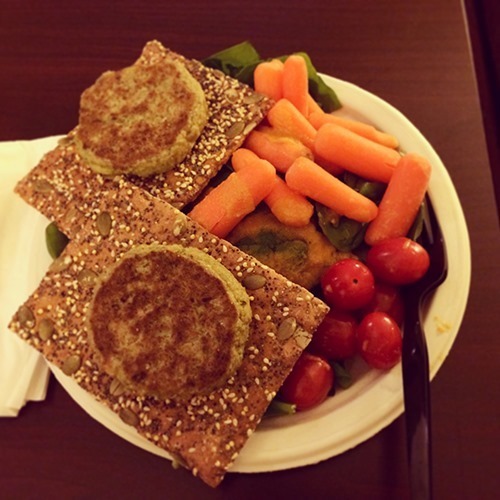 Every time I purchased a meal I made sure there were tons of veggies because I was really missing them! Hotel oatmeal is a must for when I am traveling. It keeps me full all morning. Love these tips! There are some wonderful ideas here, Kori. My husband and I are fortunate to be able to travel quite a bit and what to eat has always been an issue. Thank you so much for your suggestions. Several will be on my list for my next trip. 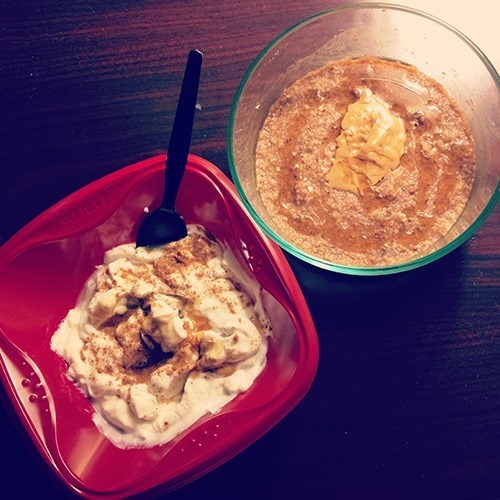 I love it when healthy people enjoy cookie butter! One of my favs 🙂 These are good tips for traveling long term. Thanks! This was awesome! 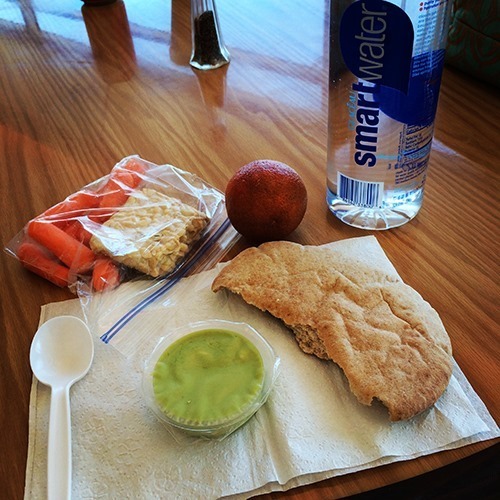 I usually travel with oatmeal, chia seeds, nut butter and protein powder for breakfast!! This post is so helpful to me! As a university recruiter, I spend the months of October and November travelling to cities, small towns and remote areas, plus other visits sprinkled throughout the year. This is so often when my nutrition and exercise routines fall off track, particularly in the more rural areas that might only have a grocery store and a few diners and fast food restaurants to choose from. 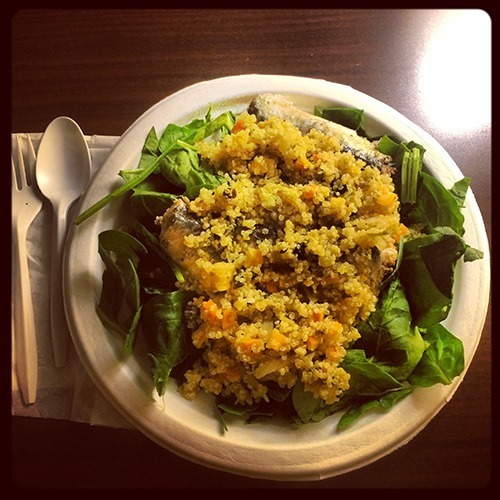 I like the specific list of things to foods and meals the writer provides – I am going to try to emulate some of these hotel meals this fall (and keep up my yoga & walking, luckily my exercise routine don’t involve much equipment!). This was really cool to read! 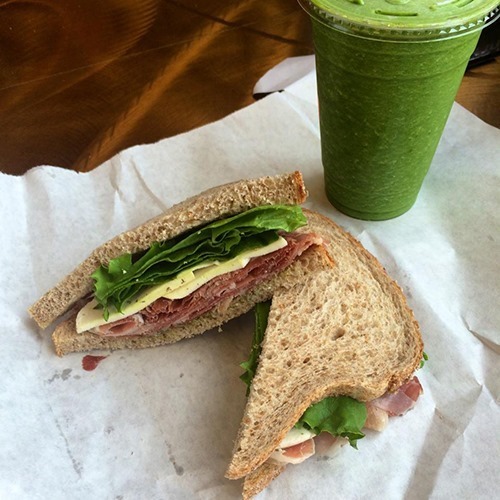 I’ll definitely come back to it the next time I travel and need some in-room, healthy & easy options! I’m so glad! Thank you for reading & commenting! Hi Kori – I noticed you seem to favor low- or no- fat choices for the dairy products you eat. I know that RD’s are probably still being indoctrinated into the conventional wisdom /U.S. government propaganda that fat is at the root of all our health woes (as opposed to refined carbohydrates, the real source of Western society’s poor health). I wondered if you and/or Kath cared to comment on this? Great post! I used to travel a lot with a sports team, and it’s hard to be an athlete on the road – trying to fuel your body and live out of a hotel room. One of the girls on my team used to bring one of those electric kettles (basically you plug it in and it boils water) and would make hard boiled eggs in it! Genius! I do have one question though….as an RD, why do you choose to eat low/non-fat dairy? I’ve always gone for full fat (and just eaten less of it…or not) because it is less processed and to me, seems like more of a “whole” food. Thanks again for the cool post! I’ve definitely share with my former teammates. Regarding dairy and fat: I eat lowfat & full fat cheese, nonfat milk along with local reduced fat milk when in Knoxville (check out Cruze Dairy Farms if you’re ever in the area! ), & typically nonfat yogurt but love to try 1% & 2% occassionally. When I eat ice cream (again Cruze Farm reigns supreme) & gelato, I eat full fat. This works for me in my lifestyle, & I see them as “whole” foods all the same. I would never eat fat free cheese because that defeats the purpose, i.e. enjoyment & quality/texture. Currently, research shows a link between high saturated fat intake & heart disease, although I fully understand there are other factors at play. Thus, I enjoy various types of dairy & work to achieve a balance. All I would recommend is that each person decide what works best for them! While I believe their study design was strong, one must take into consideration the demographics of the study. They only studied & reported on postmenopausal women; thus, the results cannot be generalized to the overall population. Also, even though the results were not significant, they did demonstrate that lower intake of saturated fats does trend towards lowered risk for CVD. Lastly, genetics do play a role, so some people may never experience adverse effects despite consumption of full-fat dairy. Thank you for offering up this article & creating a good discussion! I typically eat both breakfast and lunch at work, so this is how I approach my menu-planning most weeks. We have a small sink, microwave and fridge at work, so I bring from home to try to eat healthier and save money rather than eating out. Obviously it works well for hotel living as well! Thanks for some new ideas! This is wonderful–and it will come in really handy when we go on vacation this summer. We’re renting a cottage, so we will have a kitchen, but I’m looking for simple meals so we can spend our time exploring and adventuring instead of cooking. Funny you should’ve been in West Palm Beach – I used to spend 3-4 days out of nearly every week in the Hampton Inn in Wellington between the ages of 16-20 from January through March. I was too young to even rent a car, but luckily that hotel is about a 10 min walk to a fairly upscale grocery store. I made it work quite well and actually kind of miss that lifestyle! I always got a fridge in the room and they always had a microwave available in the kitchen. Could you tell me what Perez spinach quinoa is? I tried looking it up and couldn’t find it. 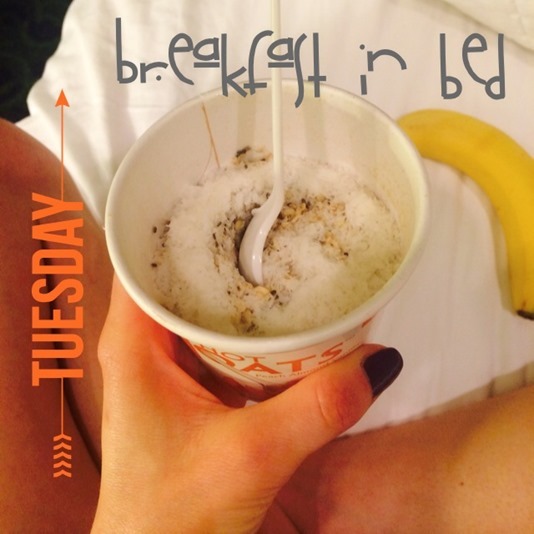 Really creative eating for living out of a hotel. And for a month! Impressive! Great post!